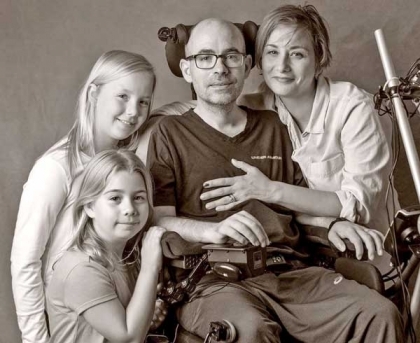 Jay Smith, his battle with ALS, and the cost of staying alive - Times Publishing Newspapers, Inc.
As you can imagine, the news was devastating to his family, wife, and two young daughters. In 2015, he wrote this in his blog after meeting with Lisa Murkowski, congresswoman from Alaska in Washington, DC. Jay was with his ALS friend, Matt Bellina, 30-years-old, a former Navy pilot from Newtown. They were both fighting to change health care costs for all disabled and still today the fight is not over. Fast forward to 2018 and Jay Smith has lost his ability to move, speak, is on a feeding tube, a suction machine, and breathing assist. He does everything with his eyes, typing in words on his computer and speaking through a speaker attached to his wheelchair. With ALS your mind is perfectly clear, but your body will no longer work. Jay is not giving up anytime soon and he made that decision early on. He focuses on what he still can do, rather than what he cannot do. An inventor by trade, Jay has currently invented three new pieces of eye technology: a program for steering your wheelchair with your eyes, adjusting your bed with your eyes, and playing video games with your kids with your eyes. Jay plans on making these programs free for all disabled. Additionally, Jay is a prolific writer with over 50,000 followers on Facebook. He has a great sense of humor and has a way of turning scary incidents into humor. People laugh and cry at the same time when they read his posts on Facebook #every90minutes. When his two girls, Loghan, age 11, and Peyton, age 9, arrive home from school, he steers his wheelchair with his eyes, greeting them, helping them with homework and instructs them on preparing dinner, giving instructions with his eyes. His wife, Melissa, works full time and then comes home at night to care for Jay, a daunting task, operating on little sleep. Loghan and Peyton are wise beyond their years. They know how to feed Jay through his feeding tube, suction him so he doesn’t choke, and use the breathe assist. Currently Jay needs the help of four caregivers. It takes two people to transfer him, one to transfer his body and another to hold his head, so he doesn’t choke in the transition. The muscles in his throat are gone and he can no longer swallow. A third caregiver arrives later in the afternoon, helping until his wife gets home from work and runs the girls to their activities. A fourth caregiver helps on the weekends. It takes a village, and that costs money. You see NONE of the cost of his caregiving is covered under health insurance. This year he will spend well over $120,000 out of pocket and that number is climbing. Jay has Blue Cross and Blue Shield, as well as Medicare, which cover NONE of his caregiving. So you may ask, “What do patients do that can’t afford the disease?” Fortunately, the Smith and Mekosh (Melissa’s) families had the foresight to open up a Medical Trust three years ago to help with his medical costs. Gene and Barb Smith, Jay’s parents, have become ALS advocates and advise people early on what to do. The Smith and Mekosh families could not do it without the support of the Doylestown and surrounding communities. Each year the Smith and Mekosh families host a fundraiser for Jay to help with the cost of his care. The proceeds go into a medical trust. These funds give Jay a quality of life. Without these funds, Jay may not have the option of staying alive. And he continues to contribute, write, and invent, living life with purpose. On January 26th, 2019 from 5:30 to 10:00pm, the Smith and Mekosh families are hosting an event, jazzforjay#endALS for Jay and his family at PineCrest Country Club in Lansdale. 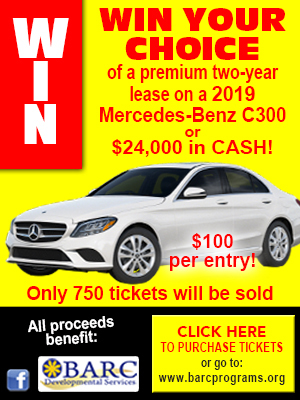 There will be a sit-down dinner, music by The Eric Mintel Jazz Quartet with a special appearances by Jenny Lee Stern and Jamie Stem, raffle, silent and live auctions. All monies raised will go toward Jay’s care. Come join the fun! To register, donate, or donate an item for this special event go online to jazzforjay.com or contact Barb Smith at 215-601-2529 or besmith8000@gmail.com, or Patti Mekosh at 215-264-7370 or pmekosh@gmail.com. You can also donate or register at jazzforjay.com. PHOTO CAP: Jay Smith with his wife, Melissa, and daughters, Loghan and Peyton.